Any special features such as a front basket? Chain guard, if there is one. How comfortable the saddle is, and you’ll only have a short ride to test ride, it changes for longer rides. Are the handgrips comfy? Are they made from durable material? The pedals, what they are made from and are they grippy or slippery? Wheels and tyres – are the tyres puncture proof, do they have reflective strips, how long wearing are they? What do the wheel rims look like and would they be able to withstand some rough treatment such as riding down gutters and over stones? Brakes – how easy to use and how effective? Coaster or hand brakes? Side stand or centre stand? How easy is it to use and how stable is the bike when using the stand? Gears if any? If you choose single speed or geared why do you make that choice? How easy is the bike to mount and dismount? Can you dismount as you come to a rolling stop? Can you ride it with a skirt? How easy is it to adjust the saddle height? Is there a quick release for the front wheel? Is it easy to operate? This is not a necessary feature unless you need to carry it in the car. Ease of riding/steering/accelerating? Does it feel heavy or unwieldy? Or light and fast? I hope this list might be useful for anyone contemplating buying a new bike this Spring. Enjoy riding! 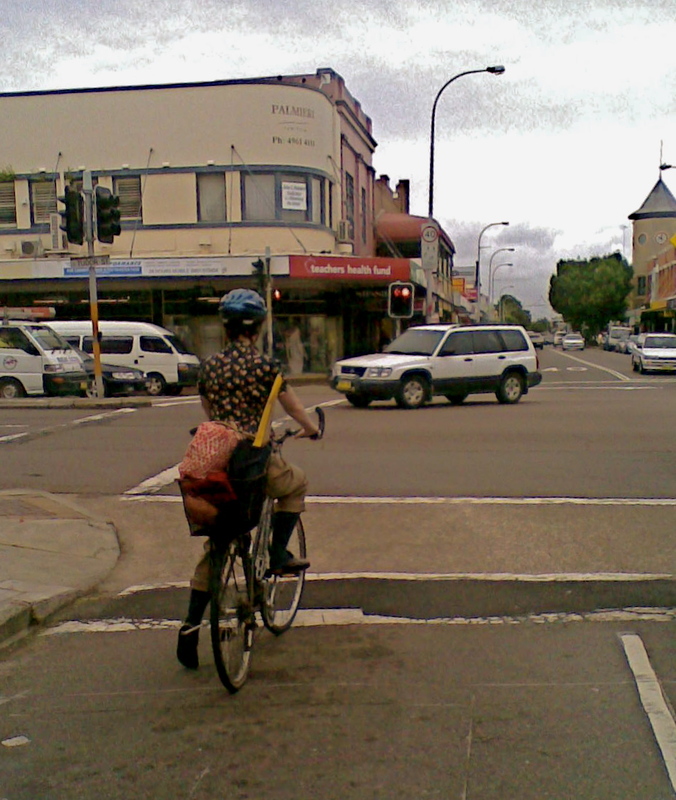 This entry was posted in Uncategorized and tagged Beaumont St, bike commuting, buying a bike, newcastle, street cyclist, women on bikes. Bookmark the permalink. Thanks Kimberly. She said it was helpful for her, so I hope it’ll be useful for others as well. Good points. Though after riding one for two years, some mountain bikes make great city bikes. Note that I said some. Basically older ones from 1980 to about 1995, those that are all steel and lack shocks. Great clearances for fenders/mudguards, ability to add baskets or racks rather easily, wide tires, stout wheels, cantilever brakes, and not as desirable as some other bikes, so a bit more theft-resistant. While the majority seen would be diamond framed versions, there are some step-through and mixte versions out there. The bigger problem with step-through/mixte models is they usually were the lesser models in the lineup. And while traditional straight MTB bars aren’t great for city riding, swept back bars are an easy fix (usually). All great points, hopefully they will be useful to others. Many women like to ride a pretty bike that has some carrying capacity, I found it impossible to add a basket to such a bike, though a rear rack is good. Some mountain bikes had/have failry fat forks that make adding front racks or baskets hard, but there are some that have more standard thickness forks where it won’t be a problem. The mountain bike I own (early 80’s Raleigh) has had a rack or basket on the front for as long as I’ve owned it! As for aesthetics, I agree, some MTBs aren’t that attractive, especially when it became all about neon or splatter paintjobs. Mine is early enough where it was before all that, so it’s a nice understated cinnamon brown. This is such a fantastic checklist! I went out yesterday on a quest for a new bike and I wish I’d had this checklist to hand – it would have been a fantastic reminder to keep me on track, instead of trying to stop myself from yelling “wheeee!” as I was riding a test bike along an atmospheric back alley of Melbourne. I think this will be of great assistance to anyone needing a bit of advice who (like me) doesn’t really have anyone on hand to offer assistance. Thanks for sharing it. Glad to be of help Katie! I can add a line to this good check-list: take care about proper clearance between your shoes and the front wheel with fender. That’s named toe overleap if my memory is good. Ah, toe overlap, yes, a good thing to consider! Oh my goodness, that first photo is of me (taken a couple of years ago)! I was riding my beloved Trek 700 (the women’s version of this bike: http://tinyurl.com/lmmqsr8 ) which, when the photo was taken, I’d had for 13 years. 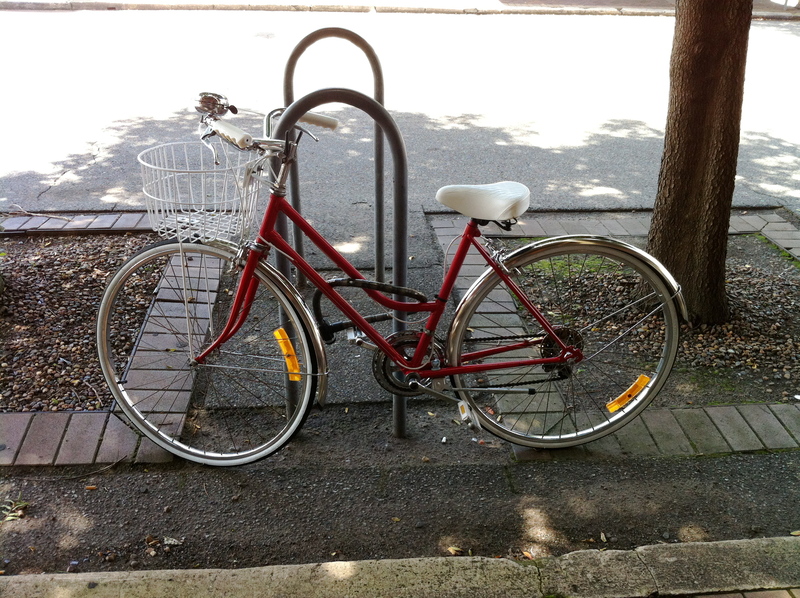 It was the best bike; a great size for me, ever so comfortable, sturdy, reliable… It had done thousands of kilometers; purchased when I was living in Central Australia, it moved with me to Hobart and then to Newcastle, enjoying a trip to New Zealand and South Australia in between. 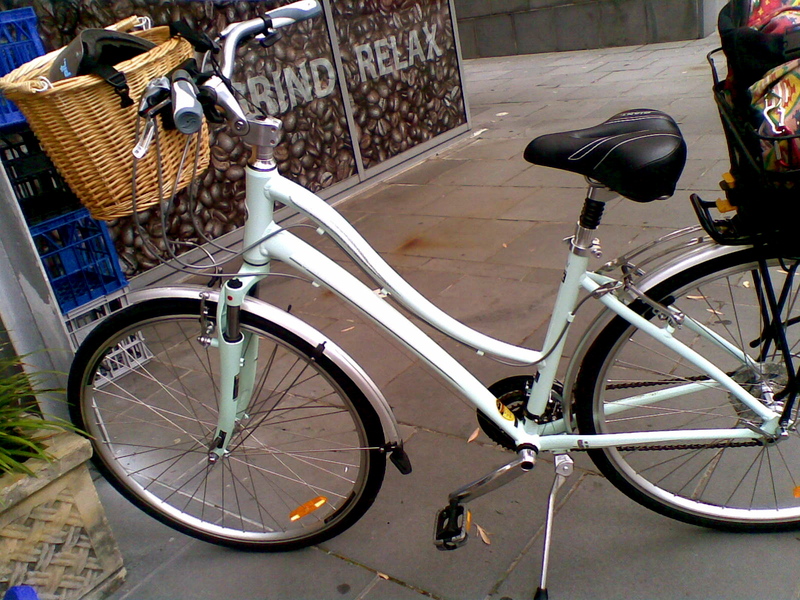 Much to my heartbreak, it was stolen from my porch (in Islington) a couple of months ago. I suspect it was probably nicked to be ridden wherever and then unceremoniously tossed in a ditch. It certainly needed a tune-up and was sounding a bit ricketty but was still such a good bike. Whoever stole it wouldn’t have appreciated how perfect it was for me. Once I’d save up the money to purchase another bike, I found shopping pretty hard going. There were fine bikes, sure, but none of them matched every wonderful feature, shape, size I’d gotten used to over the previous 15 years with my Trek. I thought purchasing another Trek might mean I get as close as possible as to what I wanted and seriously considered this one – http://tinyurl.com/n3z3uwd – but the shop I went to didn’t have my size in stock so there was no way of trying it out. I ended up with an Avanti Metro (http://tinyurl.com/ok4l2vk ) which I do quite like. The handlebar shape means I have trouble leaning on them with stability (you know – or maybe you don’t! – when you’ve cycled a long way and you’re tired and you just want to rest a little so you put your elbows near the grips and your hands near the middle of the bar and lean down and feel like for a moment you’re not hurting?) but I don’t cycle that far these days, anyway. PS – I really needed to pump up my tyres on that particular day! Hi Sam, yes of course it is Beaumont St! I took the photo when I was behind you at the lights and didn’t use it till now, so had forgotten so much about it. You looked so organised with so much on your bike. Sorry to hear it’s been stolen, I hope you’ve reported it to police and it gets returned.